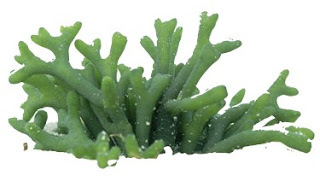 Algae is the source of astaxanthin, one of the most powerful antioxidants. works as an internal nutritional sunscreen and actually boosts your skin's tolerance to ultraviolet radiation. Scientific research has shown that astaxanthin is a true anti-aging wonder because it protects against collagen degradation, cell damage and wrinkles due to the rays of the sun. In studies from Carotenoid Science and others, topical application of astaxanthin was shown to increase the skin’s moisture level as well as reduce wrinkles after four weeks of application . In another study, women with dry skin saw significant improvements in spots, acne and dark rings around their eyes . Still another showed that astaxanthin improved fine lines and skin elasticity. Astaxanthin is found in microalgae, yeast, salmon, trout, krill, shrimp, crayfish, crustaceans, and the feathers of some birds. It provides the red color of salmon meat and cooked shellfish. This red-orange pigment, closely related to other well-known carotenoids like beta-carotene and lutein, has stronger antioxidant activity than either of them (ten times higher than beta-carotene, in fact). 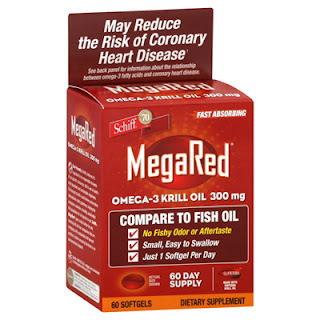 MegaRed Omega-3 Krill Oil is a good source of astaxanthin; it's an oil from pure Antarctic krill, tiny crustaceans that thrive in the frigid water of the Antarctic. 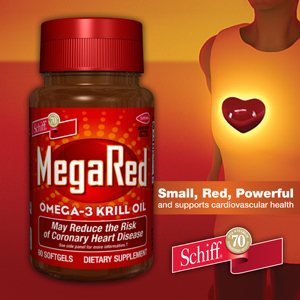 Q: Is red krill oil really all that much better for you than regular fish oil? A: Red krill oil has about the same amount of omega-3 content as regular fish oil pills, but the way that the omega-3 molecules are conjugated in krill oil, it may be better absorbed and utilized by the body. Red krill oil's capacity to reduce LDL or bad cholesterol and raise the HDL or good cholesterol seems to be better than fish oil alone and its anti-inflammatory properties appear to be better as well. There are some reports stating that after 2 weeks of taking red krill oil supplements that the anti-inflammatory potential is similar to ibuprofen. More Omega 3s. Krill Oil contains the richest supply of DHA and EPA attached in phospholipid form. Phospholipids are much more absorbable by the body which means... more DHA and EPA at each serving. Phospholipids. Krill Oil is rich in brain-essential "good fats" found in phospholipid form – the same as the human body which means there are no conversions or extra work the body needs to do. This makes absorption faster, easier and more effective. You won't get fish burps, upset stomach or unpleasant side effects from Krill Oil. Antioxidant power. Krill Oil contains astaxanthin, the carotenoid that gives shrimp, krill, lobster and other foods their pink color. Astaxanthin is a powerful antioxidant. 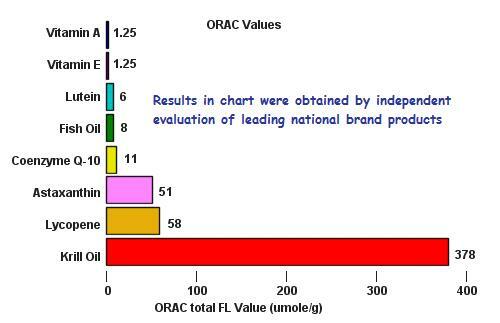 Krill oil has a very high ORAC value -- tens od times more antioxidant power than fish oil. Purity. Krill are at the bottom of the food chain. They are virtually free of toxins, metals and other contaminants. Even better, Krill oil is harvested and collected in its natural environment – the pristine waters of Antarctica!